Well this day was like no other. I’ve always wanted to swim with dolphins. I had a seal steal a wave I was body surfing on before but I’ve never swam with a dolphin. All the overweight worries never came to pass today. They had a life vest that fit and looked like everybody elses. I was able to get in and out of the pool with ease. I was able to hold on for a dorsal swim. 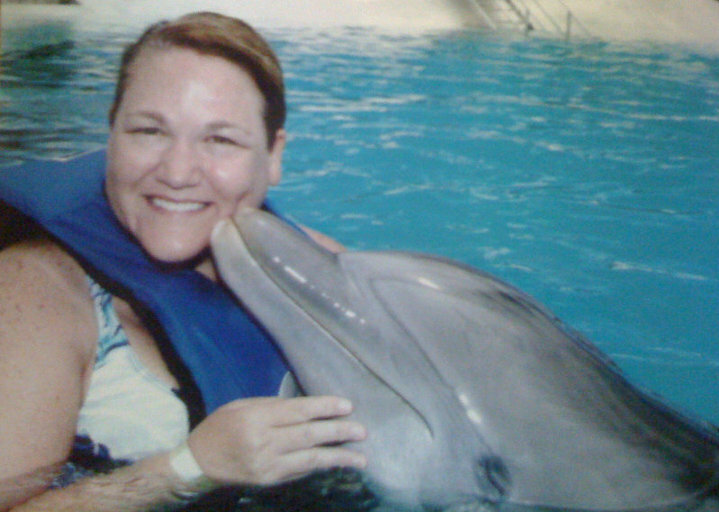 Finally, the dolphins were able to Foot Push me across the pool with no problems. I’m such a fish. 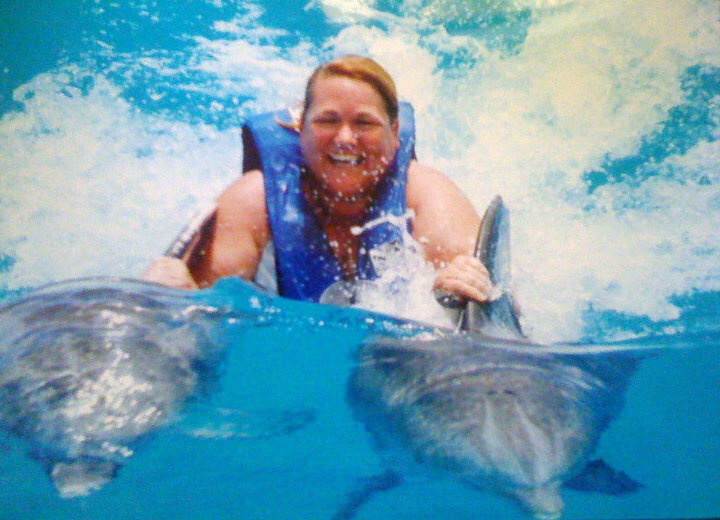 After swimming with the dolphins I put in another 30 minutes of Water Aerobics. Oh and Solomon even walked to the park twice today! I’m having a great time in Oahu. I got settled in and now I’m ready to explore. As recorded on the Bodybugg I burned 4165 calories yesterday. I walked Solomon twice and strolled along the very populated Kalakaua Ave in Waikiki. I was told that the best local fish was served at the Cheese Cake Factory. Go figure? So I found free parking on the street near the Zoo and hit the road. The walk was gorgeous, however, it was very hot. I lingered for a while a the beach called the Wall and watched the waves crash. Just beautiful! By the time I found the restaurant I was soaking wet and dehydrated. It was nice to sit on the outdoor deck and watch all of the activity. Everyone was in such a hurry. Fortunately, I have 27 more days to enjoy any way I see fit. I’m going to try not to put any pressure on myself during this time. I’m not going to rush and do rush and do. I want to find a nice balance between doing amazing things but also relaxing and being OK with my decision to just go for a drive or throw the ball to Solomon or go to a movie or read a book or have a bite of Carb-Free Cheese Cake. I had a big surprise Tuesday while watching Losing It. Jillian Michaels had an open chat on Twitter. To my surprise she answered my question. (Read from the bottom of the image to the top). Now to keep following her advise. Recently, actor and director Kevin Smith was asked to leave a Southwest Airline flight because he was deemed too fat to fly. He has since begun a Twitter campaign to boycott Southwest. The story hit me really hard when Kevin mentioned that as he was leaving the plane he made eye contact with a fellow “fatty” who was trying to sink into his seat as to not to be exposed. Who among us has not asked for a seat extender or sat for 5 hours with ankles crossed and arms folded about the chest? I have often recited to myself, “Next time I fly I’ll be skinnier.” There is a careful choreography played out while on a plane put the armrest up, think small thoughts, pray that the person in front of you will not put their seat back and lean only into the aisle when the coast is clear. I’ve cried many times on planes. The tears just come. I don’t want to cause any discomfort for other passengers. Once on a plane I assumed the position and the lady in the middle seat asked me to relax into the seat because she “loved chubby women. Her momma was chubby and her whole family was chubby.” She even said she always wanted to be chubby but to no avail. It was the best flight ever. Most of all when I fly it is another mirror moment. I am once again disappointed with my efforts in this area of my life. For hours I sit there uncomfortable and thinking of nothing else. Oh how could I let this happen. This world is just not made for people of my size but, I do believe there needs to be a little more compassion. It’s as if it has become socially acceptable to be mean or derogate obese people (I can’t believe I used the “o” word). Since the “Too Fat To Fly” story broke the media has made it seem that we are this united group of people and as a group we think that we’re entitled to special treatment or allocations. But I believe that the airlines have negated many other populations of passengers that are not only large but in my friend’s case “freakishly tall.” Yes on his last flight he overheard a flight attendant use those words to describe him to a passenger in an effort to free up a seat for him in the Emergency Row. We as a society are just supposed to deal. Squeeze into the seats with both armrests down or as in my friend’s case put your knees up to your chest and deal. Whatever happened to customer service? In the days since the incident the most recent angle that has transpired with this story is how not only do large people infringe on the rights of other passengers but we also create an emergency hazard if we have to disembark the plane. Give me a break. We’ll deal and accept your disdain as a group of people whom you can still pick on but, in the mean time I’ll keep on keeping on. I’ll board the airplane, sit next to you at movie theatres, scan the room for armless chairs and walk in your gym all the while knowing that you have no idea what it’s like to walk a mile in my shoes carrying 100 pounds. Let me know what you think leave a comment! This morning I came across an amazing program called My Big Fat Body on Discovery Health. The star of the show, Frank, went through an amazing realm of tests. The most interesting was the Anti-Gravity Treadmill or Alter-G Treadmill. It’s a normal treadmill but the lower half is completely encased in plastic. The Alter-G Treadmill reduces your weight by a certain percentage. On any given day at 363 lbs. Frank’s knees experience 720lbs of pressure. This treadmill reduces your weight by 30%, by 50% or even 99%, which is very useful if you need to take the load off your joints. I too have a knee injure that flares up from time to time so I was very interested. At first Frank was walking at his normal pace but soon the chambers air pressure was modified and pretty soon he was walking at 28% air pressure, which was 100 lbs less, then 50%. He actually had a bounce in his step. He was running like a gazelle. When his 200lbs were added back the bounce was gone and the laboring step returned. It was such a visual representation of what life will be like when my bounce returns. Call me Tigger. I’m leaving Eeore behind. An elder at my church shared these words with me in reference to what the Lord declares to be true of me. For me to walk in this truth at times is difficult for me to accept. This truth is laid out more times than I can count in His word but when I’m undisciplined it is difficult for me to accept. I have struggled and hidden this part of my life even though it is the most obvious thing about me. I teach about goal setting all day long with my students and yet my most obvious goal is the one thing I have yet to be able to achieve. It is hypocritical. So if I want a life of integrity I must be disciplined in the little things. I have pride when I know that I have made good choices throughout the day. Going the extra mile and not phoning it in sets an example but most of all it makes you proud. Rising above laziness and following through with a plan will make you that much stronger so you won’t be pushed around.